All vineyards belonging to the Lunelli Group, located in Trentino, and grown for the production of Ferrari Trentodoc have received an organic certification: the long-awaited news came on March 20, only a few days ahead of the opening of Vinitaly 2017, rewarding the commitment of the Lunelli family in putting natural soil fertility, environmental protection, and working conditions back at the heart of farming activities. This achievement came at the end of a long and challenging process that started more than 20 years ago. A number of studies and pilot projects carried out in the field in partnership with the Fondazione Mach showed that, once the proper balance of the vineyard is found, growing organic vineyards is possible also in mountainous regions. Over the years the use of herbicides and chemical fertilizers has been banned, promoting instead traditional practices such as the use of green manure, natural fertilizers (i.e. manure), and the exclusive use of the safest plant protection products that preferably contain natural substances such as copper or sulphur. In this framework, the process of transition towards organic farming in all vineyards belonging to Ferrari Trento was launched in 2014, reaching its successful conclusion only a few days ago. Over time, this mindset hinged on the concepts of sustainability and respect for the land has been shared with more than the 500 families that provide Ferrari Trento with their grapes through training and education activities led by Ferrari’s own team of agronomists. All grape suppliers were asked to follow a strict protocol aimed at promoting a healthy and sustainable mountain winemaking process. “The Ferrari Vineyard” protocol was developed with the scientific support of the Edmund Mach Foundation and certified by CSQA. In addition to ensuring the top-notch quality of the plant and the grapes grown, these initiatives positively affected the surrounding region, which today boasts a richer biodiversity, attested by the “Biodiversity Friend” certification awarded by the Worldwide Biodiversity Association. 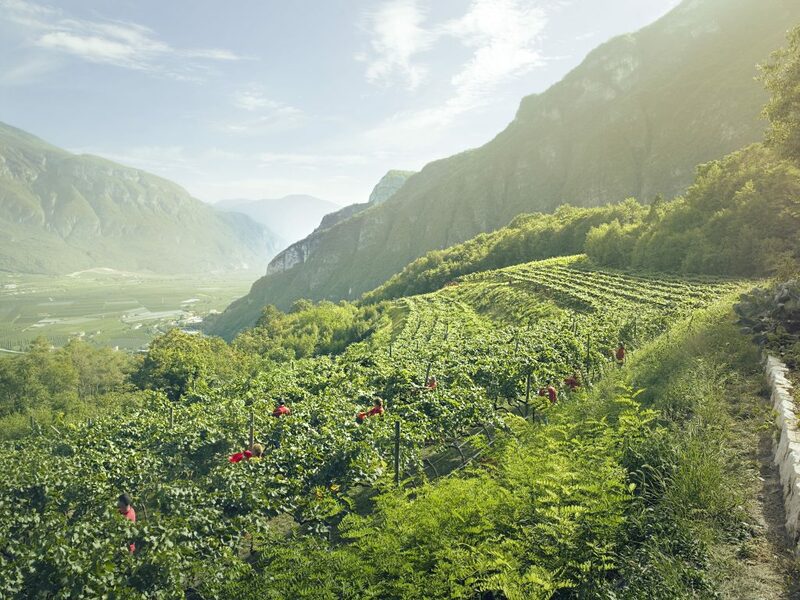 The mountainous landscape of Trentino has been transformed over the centuries by the continuous work carried out by mankind, levelling the steep mountain elevations through the cultivation of vineyards that are now grown and treated as gardens. Today, only these mountain vineyards can ensure the excellent produce at the basis of the Trentodoc sparkling wines. They now grow even more in harmony with nature, thanks to the important achievement conquered by Ferrari Trento showing the ability of the company in keeping alive the groundbreaking spirit of its founder. Giulio Ferrari found more than one century ago the perfect soil to grow the Chardonnay grapes employed in crafting the Classic Method sparkling wines in the mountains of Trentino. “The organic certification awarded to all vineyards located in Trentino and belonging to our family represents an important achievement, with a cascade of positive effects on the whole production chain. In terms of corporate social responsibility, it strengthens even more our commitment to the areas where we operate” said Marcello Lunelli, vice president of Ferrari Trento.